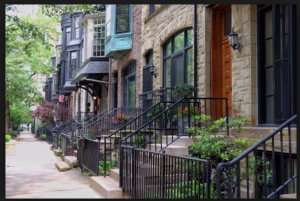 Undoubtedly one of Chicago’s most affluent neighborhoods, is the Gold Coast. It is the neighborhood nestled against Lake Michigan shoreline bordering Lincoln Park and the Magnificent Mile. It boasts a mix of grand 19th century mansions, luxury high-rise condominiums and renovated gray and brownstone walkups. Here, old and new seamlessly blend together with the connecting thread of wealth and status. Shaded avenues, landscaped walkways and prim wroughtiron fences add to the neighborhood’s refined appeal. A stroll among the massive stone structures that once housed many of Chicago’s wealthiest and most influential families is breathtaking. Sharing the block with lofty, contemporary condos are majestic, symmetrical Georgian Revival mansions and impressive, stone-turreted townhouses that unquestionably suit the elite, but welcome the attention of any passerby. In fact, Gold Coast neighborhood architecture and history is celebrated by annual walking tours sponsored by various architectural foundations.